At Acana, the mission is clear and powerful: they only prepare with 100% organic, fresh regional ingredients. This way, dogs that eat Acana will only get the very best. 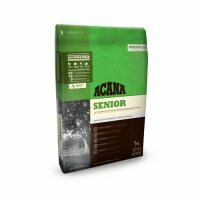 Acana dog food also distinguishes itself by its expertise as a specialist food producer, with a focus on quality. Acana has been doing this for 25 years now in Morinville, Alberta, Canada and they are not finished yet! All Acana food is still prepared in the certified kitchens in Alberta, Canada. The brand is owned by the company Cat & Dog Petfoods. This company also owns the well-known brand Orijen. Dogs are carnivores; they need meat and fish and only small quantities of vegetables, fruits and herbs. Acana produces animal food according to the Biologically Appropriate principle. This dog food consists mainly of fresh ingredients that are also approved for human consumption. In addition, Acana food does not contain any added colourings, aromas or flavourings. These ingredients are delivered fresh daily and processed by the producer. You could say that Acana is trying to imitate the natural diet of dogs. 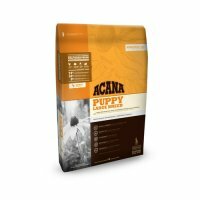 The ingredients of Acana dog food are different from other pet foods. They do not buy any bulk raw materials or ingredients as with other types of dog food. Acana only acquires ingredients that come from a certain region in a sustainable way and are also suitable for human consumption. 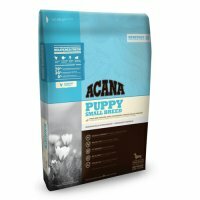 The Biologically Appropriate concept entails that the ingredients used in Acana dog food is made of fresh ingredients. Moreover, these ingredients are processed in such a way that they mirror what dogs are naturally evolved to eat. The entire Acana range does not contain any artificial colourings, flavourings or other additives and are free of GMO's (Genetically Modified Organisms) and antibiotics. 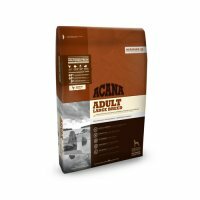 Acana dog food is available in 4 varieties: Acana Classics, Acana Heritage, Acana Singles and Acana Regionals. 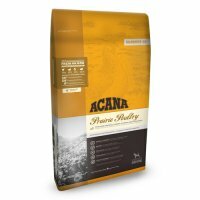 The Acana Classics dog food is available in three different flavours: Prairie Poultry, Wild Coast and Acana Classic Red. All of the Acana Classics dog foods each contain at least 50% fresh chicken, turkey, eggs, meat or fish, from free-range chickens, nest-laid eggs, wild-caught fish or heritage red meats. Acana Heritage is the original Biologically Appropriate range by Acana and also incorporates free-range chickens, nest-laid eggs and wild-caught flounder. There is a variety specifically designed for every phase of your dog's life. 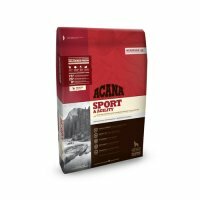 Acana Singles is produced with a single source of protein, supplemented with a small amount of fruit and vegetables, making it particularly suitable for diet-sensitive dogs of all breeds and life stages. The four different varieties are filled with meat and include New Zealand lamb, Ontario duck, Alberta pork or Vancouver Island pilchard in WholePrey ratios. Acana Regionals contain even more meat than the aforementioned ranges, with 70% meat, over half of which is fresh meat. The remaining 30% consist of locally grown fruits, vegetables and herbs. The diets in this range are rich in protein and low in carbohydrates. 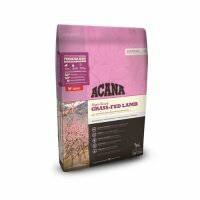 Acana Regionals come in four different varieties: Ranchlands, Grasslands, Pacifica and Wild Prairie.